As an avid, long-term gamer, I have spent hours upon hours playing first-person shooter, role-playing and action-adventure games. I learned early on that if you do not have the proper gaming equipment, it is impossible to succeed in the online gaming world. When my mouse began to malfunction several weeks ago, I knew a replacement was needed immediately. So, I ordered the Redragon M902 SAMSARA 16400 DPI Gaming Mouse from Amazon and could not be happier with my purchase. Below, you will discover my in-depth review of this product. Gamers are limited to how much time they can spend transitioning from one game to another. This is where the memory profile feature comes into play because it can help you make these transitions quicker and easier. 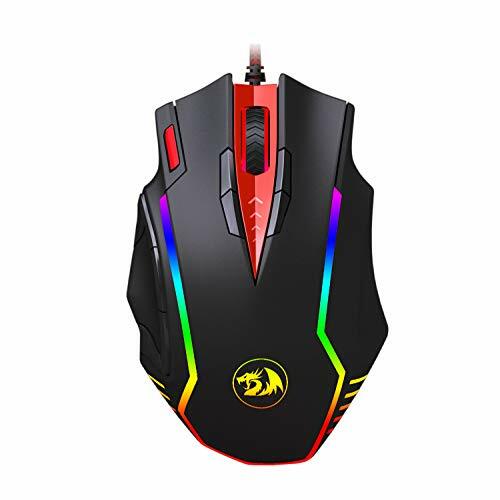 What I like about the Redragon M902 SAMSARA is it features five memory profiles, which are easily identified with a recognizable light color. The programmable buttons can be set up in seconds, and when I am ready to transition from a role-playing game to an action-adventure game, I just need to select its associated memory profile. If you are like me, I require superior flexibility during my online gaming adventures. With that said, a mouse with a short, flimsy cable just will not do. When scouring through the available gaming mice on Amazon, I noticed a lot of brands are equipped with a short cable, but not the M902. I was immediately taken aback by the M902’s durable USB cable, which is constructed from braided-fibre. This design ensures me that I will receive a long service life from the mouse, plus the extended 6-foot length will offer me plenty of flexibility. When I grab ahold of my gaming mouse, I expect to feel sturdiness, with some weight. Of course, some people prefer a lightweight mouse, because they either have small hands or require more manoeuvrability. With the eight-piece weight tuning set that is included with the Redragon M902 SAMSARA, I am able to create the perfect weight within seconds. Redragon also threw in a cool carrying case that is specifically designed for the weights. I believe the Redragon M902 SAMSARA 16400 DPI Gaming Mouse is one of the best purchases I have made in years. The contoured design gives me full control, whether I am leisurely playing an online puzzle game or trying to defeat my toughest opponent in a challenging first-person shooter game. The gold-plated USB connector provides the highest level of signal accuracy, as well as the mouse pointer. While the color availability is limited, I couldn’t be happier with the white mouse I chose. It coordinates with my computer and gaming console. If you want to find more great mice like this one priced under 50 dollars then check out this guide which actually features the sister m901 mouse.